My wife and I enjoy visiting little towns. For a brief period we lived in Malinalco. This beautiful colonial town, one hour away from Mexico City, was in its time an important military observation point for the Aztec empire. In addition to its quaint architecture, its traditions and customs, its temperate climate and its people, we were attracted to the Augustine convent with remarkable murals not only in the main church, but in all of the vaulted ceilings along the many rooms and corridors. These murals were finished around 1570 as part of the Spanish catechization effort. They were done in magnificent frescoes. From a tiny apartment in front of this convent we planned our outings to the surroundings and many times I painted. 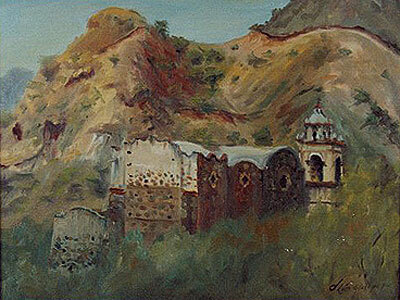 One of such outings i did by myself to the church of Saint Nicholas, some three kilometers away from Malinalco. I here present a photo of the finished painting, which I did totally outdoors. I also have an interesting story about that day. Every time we would drive into Malinalco I would see this church on the right side of the road and I would receive an impression of enormous peace. So much so, that one radiant morning I made elaborate preparations, carrying my easel, brushes, paint, canvas, folding chair, lunch, umbrella, portable radio and hat into the car and off I drove to the site. Once there, I took a deep breath of fresh air with total tranquility, and began to set my painting station in the shade of a tree. I placed a basket with my lunch on one side and a bag for dirty rags on the other. Although with some static noise, I could still tune into a classical music station. What pleasure to paint outdoors in such peace! an exquisite breeze went by my canvas and then me. I looked at my object carefully, took another breath and began. First I stained my surface with an orangy-earth wash. Then I used some thicker, dark brown paint to draw with a filbert brush the shape of the building, its tower, then the mountains behind. I placed the stained glass windows and other baroque details. The sun hit the church from the left side in such a way all its lines clearly marked its colonial style. All was quiet when suddenly a loud alarm sounded! it made me jump and turn around: hidden by the bush trees behind me was a grade school! The first noise was followed by the happy screaming of a young multitude. An artist! he is painting! y my peace was gone. I was quickly surrounded. The little ones were jumping one on top of another, yet keeping a respectful distance, forming a circle with me in the center. They started to shoot endless questions at me; I answered a few, then proceeded to explain they had to remain quiet if they wished to see me paint, else I would leave. Prompt silence fell on the midget crowd like magic. Motivated by this sudden act of respect, I put my brush to the canvas and quickly continued working. Little by little, brushstroke by brushstroke I went on, while listening to their breathing behind me. As I finished I had earned their respect and admiration. Art quickly penetrates the spirit of gentle people. This is a chapter of a book I am writing about my adventures as a painter artist. The Federico León de la Vega Estudio – Café is open to the public and is located in Paseo de la Marina 31, Nuevo Vallarta, Nayarit. Opening hours are Monday to Saturday from 8:00 a.m. to 8:00 p.m. Sundays from 8:00 to 11:00 a.m.